Rugby Borough hosted Ellistown FC on Saturday, knowing a win would take them level on points with leaders Thurnby Rangers, in the Leicester Senior League Premier Division. After 22 minutes Ollie Chater curled a lovely ball over the keeper into the roof of the net from the corner of the 18-yard box. The lead grew just six minutes later after a great play down the left between Chater and Sam Beasley, who squared the ball for Josh Turton to score. 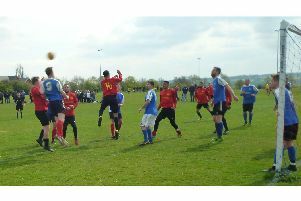 Ellistown then produced their first attempt on goal, with a shot just wide from inside the box. With 33 minutes on the clock Beasley made it 3-0 from a nice cushioned volley into the far corner. Early in the second half Jamie Paye converted a penalty to make it 4-0. Paye scored his second, and Borough’s fifth goal, tapping home a Tommy Glasscoe cross from Luke Pritchard’s pass. Ellistown scored a consolation in the 77th minute to deny Borough a clean sheet. Borough responded with two more goals in the last 10 minutes, both scored by Pritchard for a final score of 7-1. Borough play their Coventry Charity Cup quarter final at home on Monday night (December 3) against Coventry Plumbing FC kick off 7.45pm at Kilsby Lane.